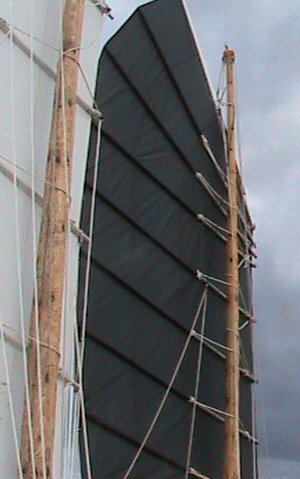 You might notice that the foresail only has batten pockets from the leech to where the batten parrels attach whereas the main has pockets all the way across and gaps for the batten parrels. This is because I made the main first and later found i needed more flexibility when it came to attaching the batten parrels. I had to extend the main parrels right to the luff to prevent them from binding when furling the main. I may modify the main like the foresail but for now it’s working well. I haven’t got running topping lifts for the foresail yet as I can’t seem to find any nylon thimbles locally – just clunky galvanized ones that are heavy and could chaff the sail, or so I fear. 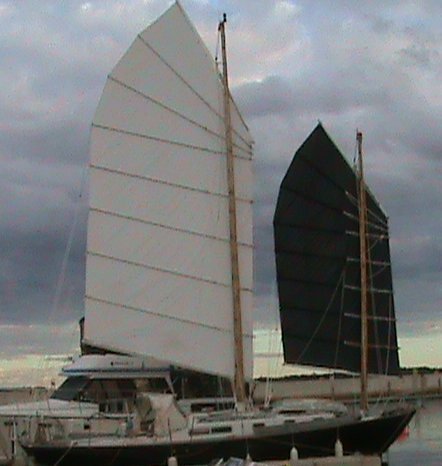 This entry was posted in alberg 37, junk rig, junk sail and tagged alberg 37, junk rig, sails, schooner, schooner junk. Bookmark the permalink. Congratulations. Can’t wait to hear how she sails.